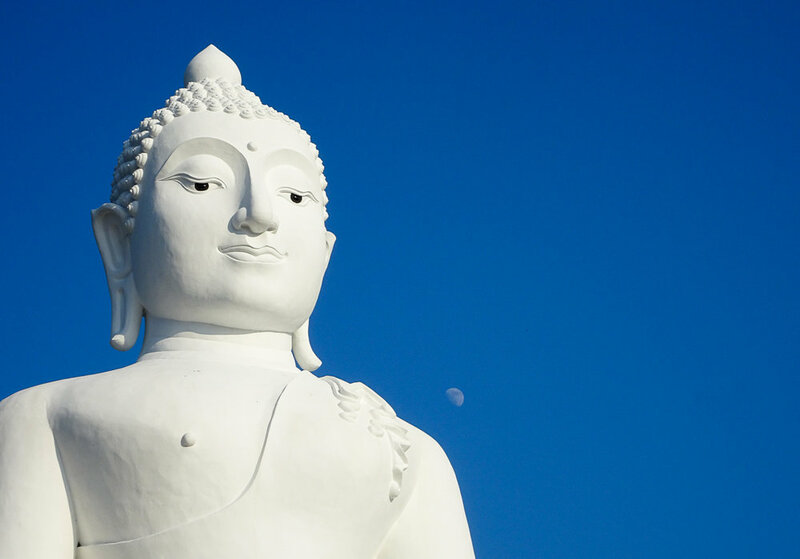 Before going to Pai, we read more than a few blog posts from fellow travelers. It became evident very quickly that some people love Pai, and some people despise the place. The main reason that people don’t like this town is that it has become “too touristy.” Well, they are right. It is certainly touristy. But I think not liking a town because it’s “too touristy” is pretentious – we are all tourists. Ok, sorry for ranting. But it's sad that Pai gets a bad rap because it has so much has to offer! Below are the top 5 reasons that Megan and I fell in love with Pai and would go back in a heartbeat! Pai is not easy to get to! 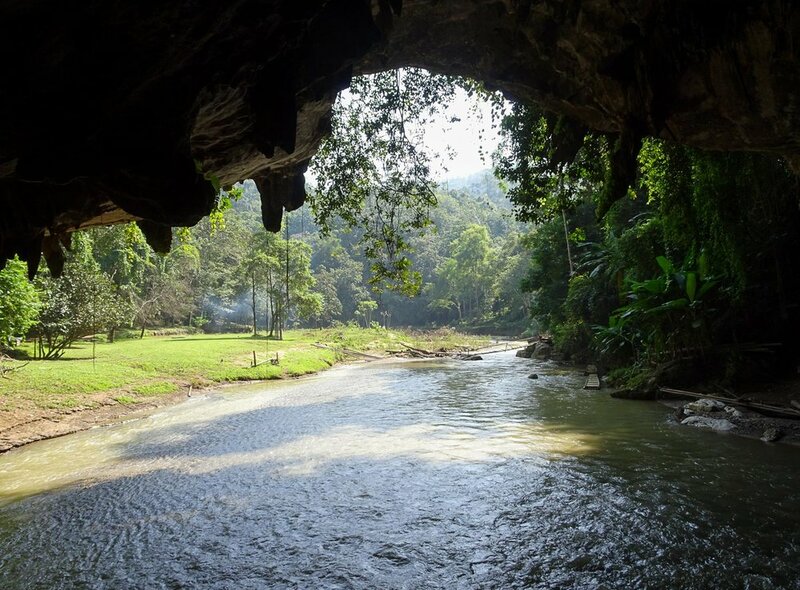 Located in the northern mountains of Thailand, the best way to get there is a 3-hour mini-bus ride on a winding road from Chiang Mai. While the bus ride can be a little uncomfortable, the views are amazing the entire way. Rolling hills and large mountains are around every one of the 700+ hairpin turns. 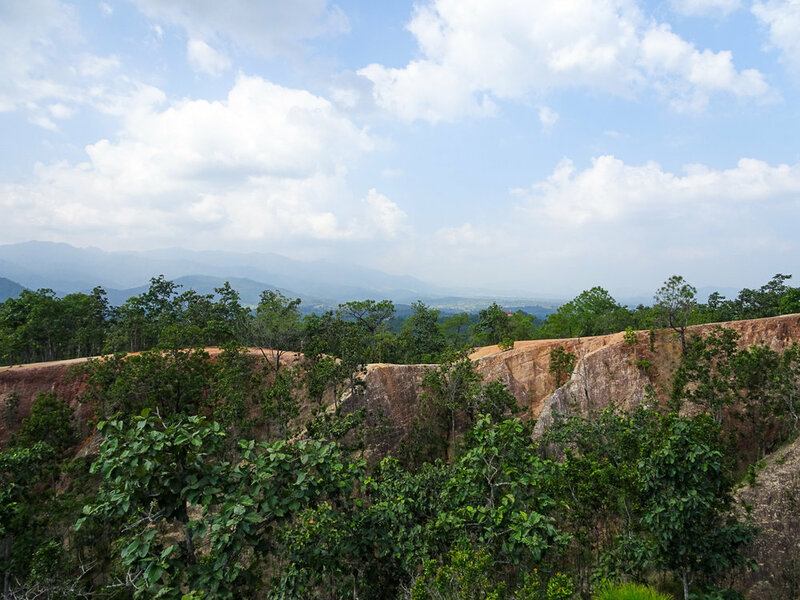 The landscape around the town of Pai is no different. Not to mention the remote location definitely adds to the allure of the untouched landscape surrounding this small town. While I do refer to Pai as “small”, this is only relative to Chiang Mai, where you'll most likely arrive from. Pai, in our opinion, was the perfect size. With a population of approximately 3,000 people, there is a city center that you can easily explore by foot in one afternoon, or spend a week exploring every nook and cranny. It is big enough to entertain, and small enough to charm. Hands down the best part about Pai is how much there is to do in the surrounding area. 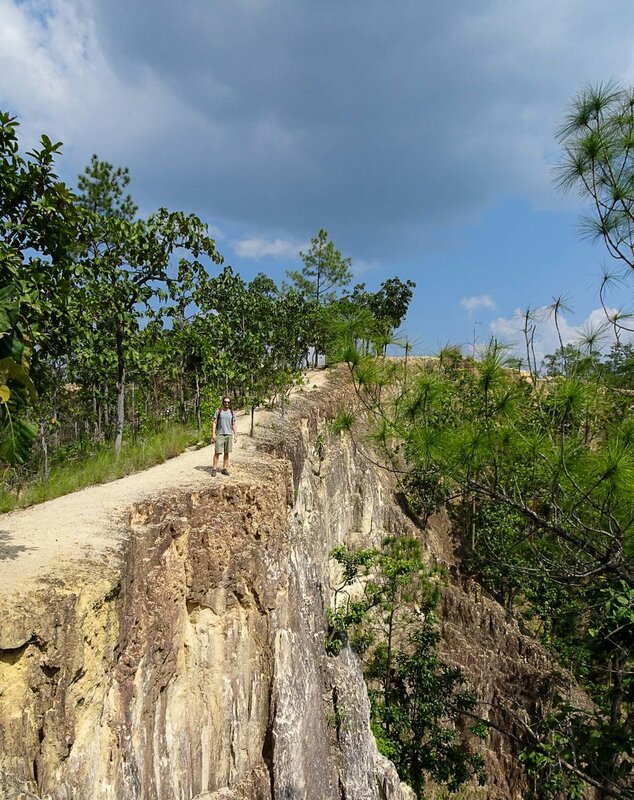 The Pai Canyon, located about 10 minutes outside of town by motorbike, offers great hiking in a unique canyon landscape. 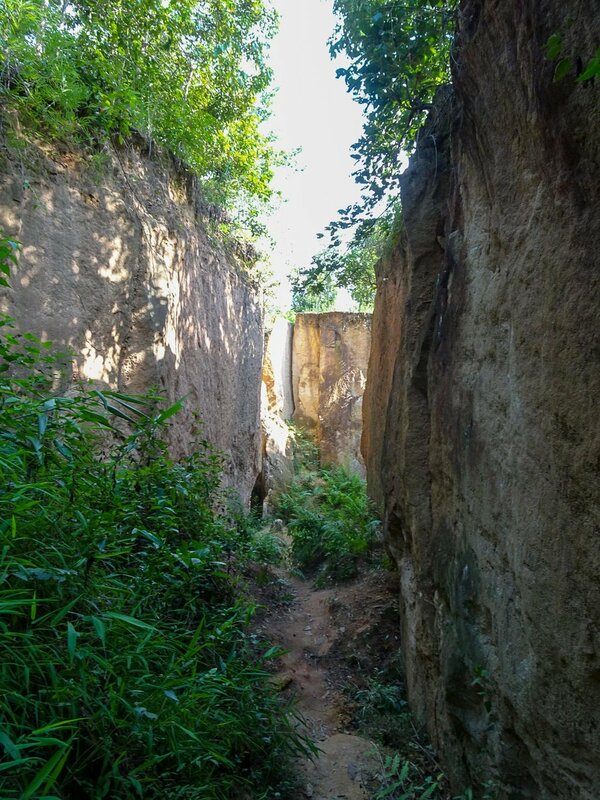 Just be sure to watch your step as the pathways are narrow and formed by quickly dissolving sandstone! We also couldn't find any map of the area so we simply followed the trails wherever they went. It's a fun, if not slightly confusing, adventure. 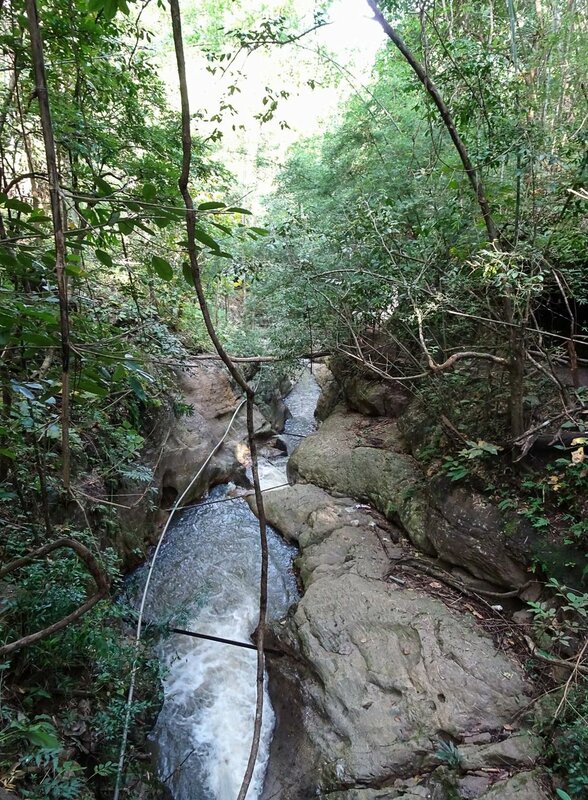 There are many waterfalls in the area around Pai, some easier to get to than others. We opted for the Pam Bok waterfall and it did not disappoint. The drive there on the motorbike was just as spectacular as the waterfall thanks to views of the countryside and lush rolling hills to traverse! On the way back to town from Pam Bok, don’t forget to stop and check out the Land Split! Caused by an earthquake in 2008, this geographical feature is unlike any we’d ever seen. The split is located on an organic farm and it actually ruined almost 80% of the farmer's land after it occurred. Rather than go bankrupt, the savvy farmer turned the split into a "tourist destination" and happily offers visitors bananas, juice, wine, and other fruit upon arrival in exchange for a small donation. Like many other places in Thailand, there are several temples to visit during your stay. Our favorite was the Temple on the Hill which features a giant white Buddha situated at the top of over 100 steep steps. The views from the temple are just as impressive as the statue itself, and it would be the perfect place to take in a sunset over the town. Who doesn’t love a good spelunk, am I right? 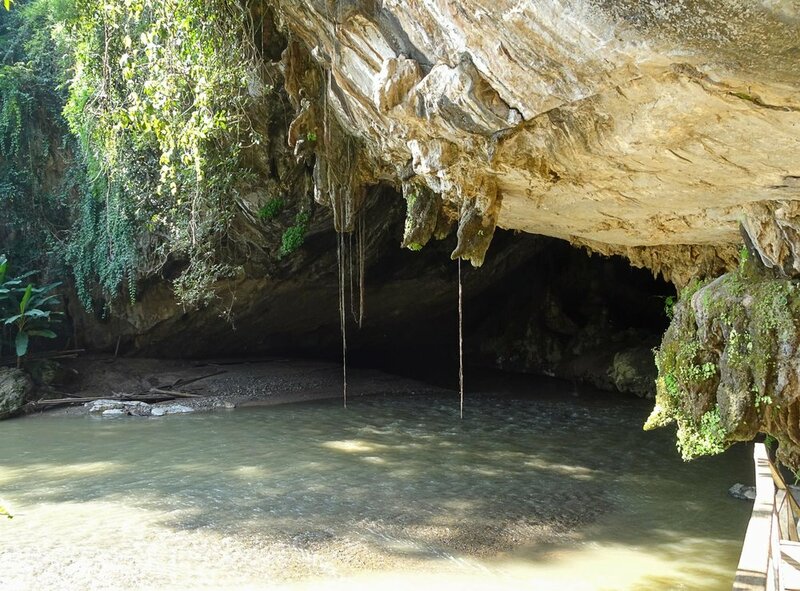 Lod Cave is a huge cavern located about 35 KM north of Pai and is something you won’t want to miss! The drive to the cave is equally as picturesque as the drive to Pai from Chiang Mai but easily doable on a motorbike (which we will get to in a bit). A visit to a hot spring might sound odd when you are in a tropical country, but the Sai Ngam hot springs really hit the spot after a chilly ride over mountain passes on the motorbike. The water was just the right temp and the crowds were limited thanks to the warmer temperatures and semi-remote location. 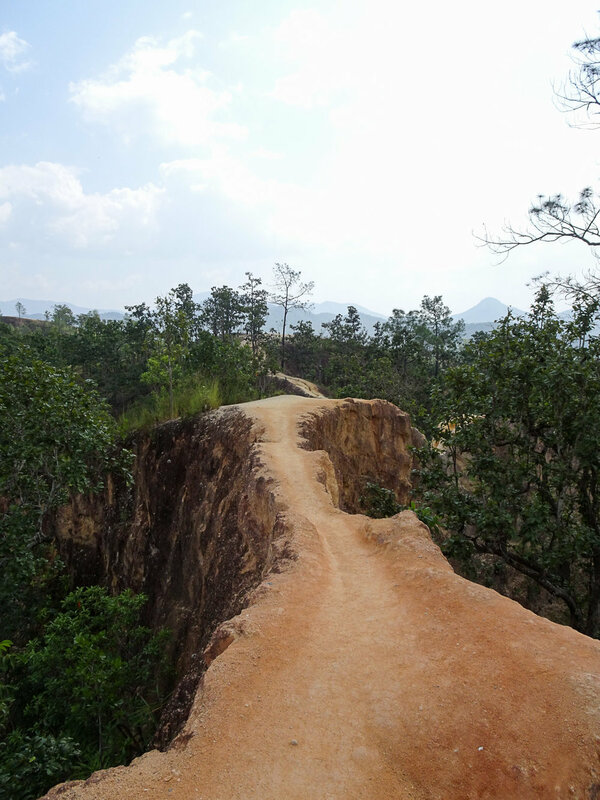 Finally, before you leave Pai, make sure to check out the view from Yun Lai viewpoint. 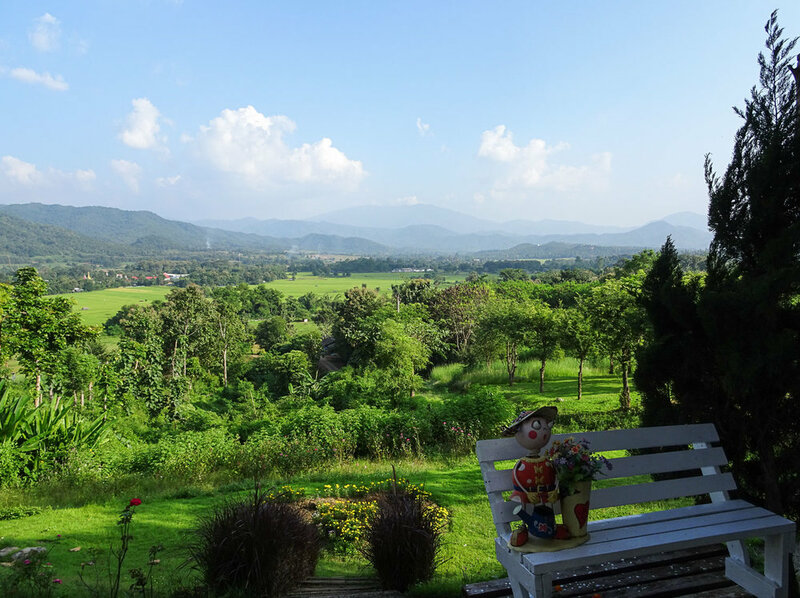 This Chinese-inspired setting offers amazing views of the entire valley surrounding Pai and is incredibly peaceful. We imagine this spot is beautiful to view at any time of day, but we timed our visit with sunset and had the place almost to ourselves. 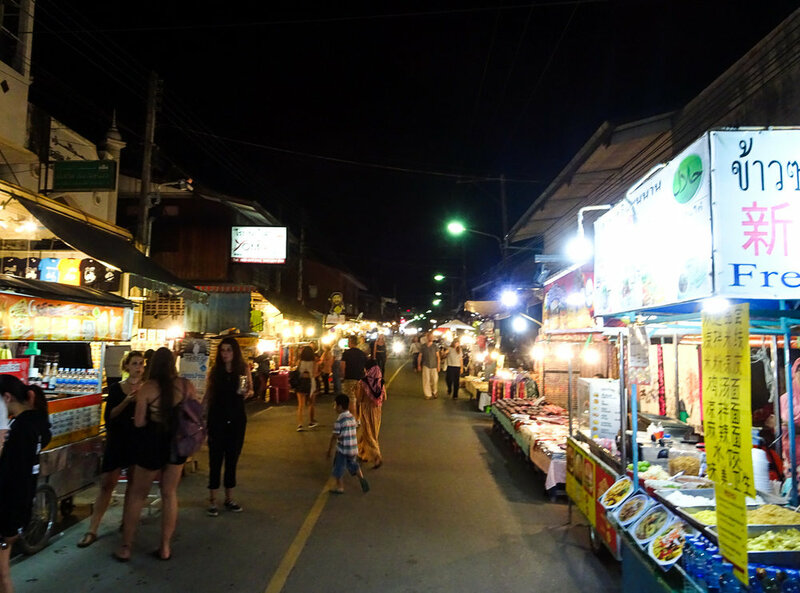 Every night beginning around 5:00 PM, two of Pai’s most happening streets turn into a shopper’s paradise. Street carts selling all types of food, crafts, clothing, etc. line both sides of the road. You could easily spend hours walking around drinking beers and eating the delicious Thai cuisine. We recommend trying 1-2 things from the most intriguing food carts for a cheap meal (almost everything is less than 30 baht, or $1 USD) and browsing the craft stalls full of hand-made trinkets from local artisans. The rumors are true; Pai is kinda hippy. There are many coffee shops, bohemian clothing stores, kombucha drinks, and dreadlocks. But the relaxed vibe and slow paced lifestyle (for Thailand standards) is what makes you want to stay in Pai longer than planned. Many of the accommodations have embraced this atmosphere and have created some pretty relaxing spaces. We stayed at Tribal Pai Backpacker Hostel and loved it! 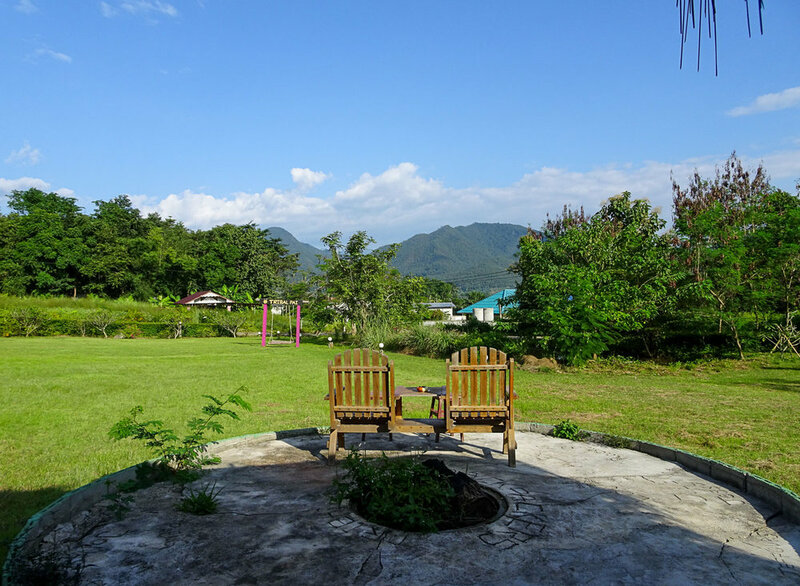 With our own private bungalow, a large common bar and lounge area, a fire pit, and WiFi, we had to force ourselves to leave the hostel every morning to explore. It was a little outside of town, but renting a motorbike solved the issue. 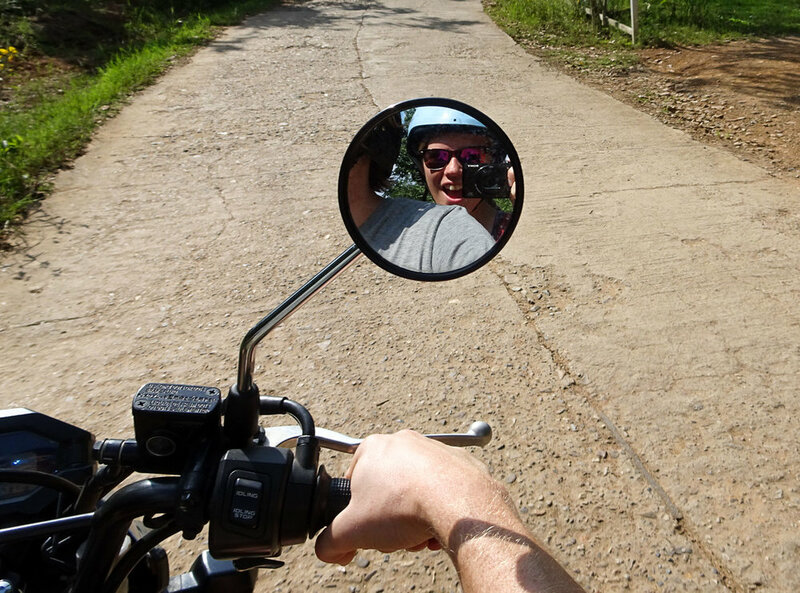 Before we arrived, we had no clue how we'd get around in Pai. There are very few taxis, and no tuk tuks, so public transportation was out. Instead, we did what everyone else does – rent a motor bike! For about $5/day, you can rent a pretty solid motorbike to take you anywhere you want to go. This is how we got around and we had a BLAST driving the mountain roads and beautiful countryside. As always, just be careful and wear a helmet! Driving on the left side of the road is tricky, and they don’t call Pai “The land of the injured tourist” for no reason. If these 5 reasons (and pictures!) aren’t enough to make you visit Pai on your next trip to Thailand, let us know and we’ll send you 5 more! If anyone has already been to Pai and loved it as much as we did, please let us know in the comments! Thanks for reading and enjoy your stay in Pailand!